The stations offer a wide range of food options as well as preordering from either kiosk terminals (at right in the photo) or the Tapingo mobile app. Houston Market at the University of Pennsylvania (Penn) was due for a makeover. 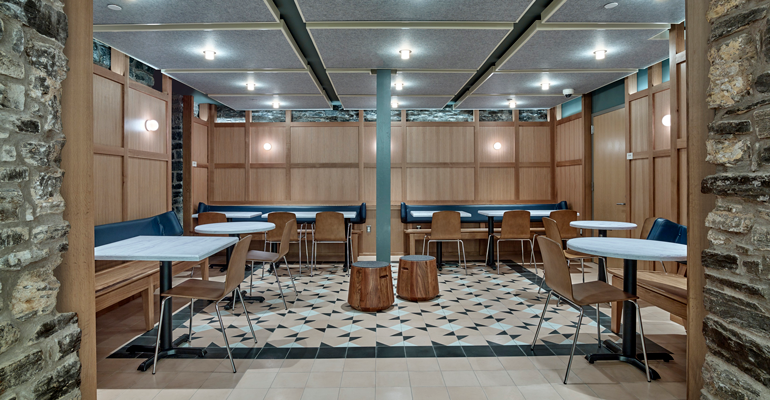 The dining center, located in Houston Hall, the first student union facility in the United States, was a cramped, crowded, ill-lighted place that students patronized only when they had to. Which was a shame because Houston Hall sits in an enviable intercept point where not only thousands of Penn students pass each day but also which is directly across the street from the Hospital of the University of Pennsylvania campus and its crowds of patients, staff and visitors. However, because of the historical nature of the building, any significant renovation has to take into consideration the impact of the changes, notes Pamela Lampitt, director of business services for Penn Hospitality Services. Hampering the project were the “beautiful stone walls” of the space that couldn’t be changed or tampered with because of historical considerations, so the footprint of the eatery had to remain the same. The renovation produced much more inviting spaces for students to hang out and socialize or study. 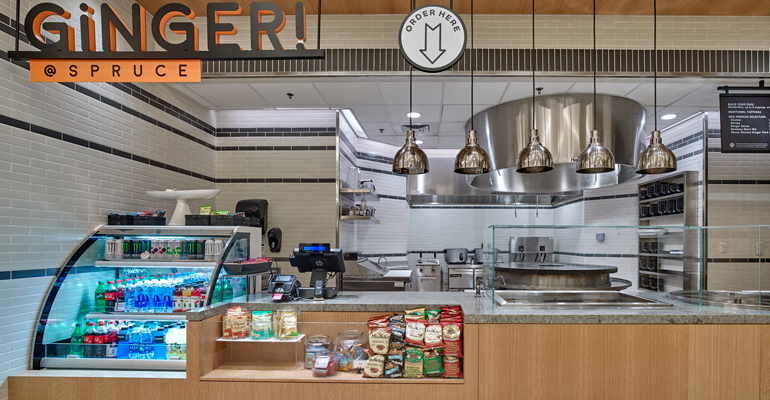 In the servery area, some concepts were switched out and a couple of new ones added so that there are now eight food stations as opposed to the six before the renovation. All are operated by Bon Appetit Management Co., which manages dining operations on the Penn campus. The renovation converted one “dead space” into the Bento sushi counter, while another space, previously the location of an ADA-mandated ramp that was now redundant, became the spot for the new Market Café bakery/coffee shop station. The existing concepts, while they were retained, received an upgrade of their menus to widen selection and increase quality. Pi, menuing wood-fired pizzas, flatbreads and strombolis using fresh, Jersey branded tomato sauce and housemade dough as well as a seasonally changing, tossed-to-order pasta bar featuring proteins, toppings and Severino branded pasta. The renovation launched this past May and took 13 weeks, with the venue reopening at the end of August. [email protected] is a popular addition to the concept mix at Houston Market, offering customized rice or noodle bowls with a range of fresh, local vegetables, proteins and sauces prepared on a Mongolian grill. There are four remote ordering kiosks to facilitate throughput from all stations, as well as the option to use the Tapingo remote ordering app from mobile devices. Also, unlike previously, when there was only one common checkout, there are now cashiers at each station. The changes in ordering and checkout “let us do a lot more customization than we could previously,” Lampitt says, noting that they have been very popular and heavily used by the tech-savvy student population. “It’s especially important here on a college campus because what we get is everybody getting out of class all at once, so it was part of our effort to manage those crowded periods,” she adds. The venue’s hours have also expanded with the renovation, so it is now open from 8 a.m. to 10 p.m. Monday through Thursday, 8 a.m. to 5 p.m. on Friday, 9 a.m. to 3 p.m. Saturday and noon to 7 p.m. Sunday. The new hours have brought new traffic patterns. The renovation had to respect the historical nature of the space, including the stone walls that prevented any expansion of the facility footprint. 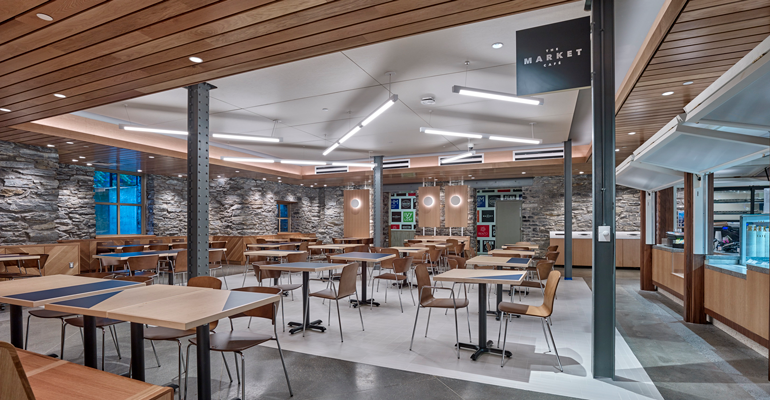 An improvement in design allows individual stations to open on their own rather than all of them being either collectively closed or open so, for example, the Market Café can open early or stay open late while the rest of the café is closed. “So now we have more flexibility from both a financial and a user perspective,” Lampitt offers. She says customer counts are up “significantly” from the prerenovation days. Customers are a mixture of resident and commuter Penn students as well as a fairly hefty number of visitors from off campus, primarily from the medical facilities nearby. While these have their own onsite dining options, Houston Market draws them with its attractive pricing (“not as low as the food trucks around here but otherwise very affordable,” Lampitt offers) and its impressive array of choices. There are more outlets for those plugging in computers, the lighting has been much improved and seating made more comfortable and inviting. The space seats about 350. 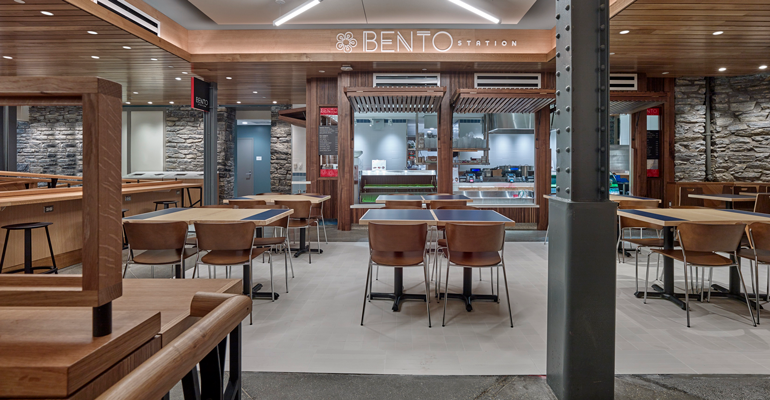 The Bento sushi station sits in a previously underused “dead space,” one way the renovation was able to add a couple of more concepts without adding to the dining facility’s constrained footprint. Local sourcing of ingredients and waste reduction—longtime priorities for Bon Appetit—have also been implemented. For instance, the exclusive use of disposable servingware has been supplemented with a permanentware option and separate trash receptacles invite diners to separate their trash. “This past summer we spent a considerable amount of time with a consultant on trash disposal signage, and we also now have table monitors who help clear the tables and dispose of the trash in the proper receptacles,” notes William Hess, resident district manager for Bon Appetit at Penn. In the back of the house, a pulper is used to process food waste, which is then sent out to be used as animal feed by a local company called Organic Diversion. While the Penn campus has yet to meet Bon Appetit’s corporate goal of at least 20 percent of food served coming from local sources, the operation there has lined up an array of area businesses which it supports. They include Capogiro Gelato, LaColombe Coffee, High Point Bakery, Sweet Nina Desserts, Darnell Cookies and natural/organic/gluten-free prepared foods vendor Pure Fare (owned by a Penn/Wharton School grad), all based in Philadelphia, as well as Roseda Beef from nearby Monkton, Md., and Balthazar Bakery from nearby Englewood, N.J. In addition, Philadelphia’s Common Market, which aggregates and distributes product from several hundred small area farms, supplies produce that was sourced locally.